Fall Is Here, Time to Preserve Duck! Football has started, the sky is slate, the air is cold and winter will be here soon. One of the very few excellent things about winter in Cleveland—besides surfing on Lake Erie (see No Rez Cleveland) and Sunday morning fires on the hearth—is the opportunity to eat duck confit all winter long. Best part about duck confit is, make it once, and you’ve got it on hand till April—it’s always there for you. Whether for an impromptu lunch or a fancy dinner (I’m planning a cassoulet for an old friend next Friday), or a last-minute appetizer for last-minute guests. On Saturday I picked up 12 gorgeous duck legs from Plum Creek Farm. Because I was doing a variation on this pickled chillis recipe that day, I thought I’d use similar seasonings in the cure for the duck. 1. Cure (optional but recommended, especially if storing for months): Give each leg an aggressive four-fingered pinch of coarse kosher salt and refrigerate for 24 hours. That’s all. Do you want to add flavors? Add them now. 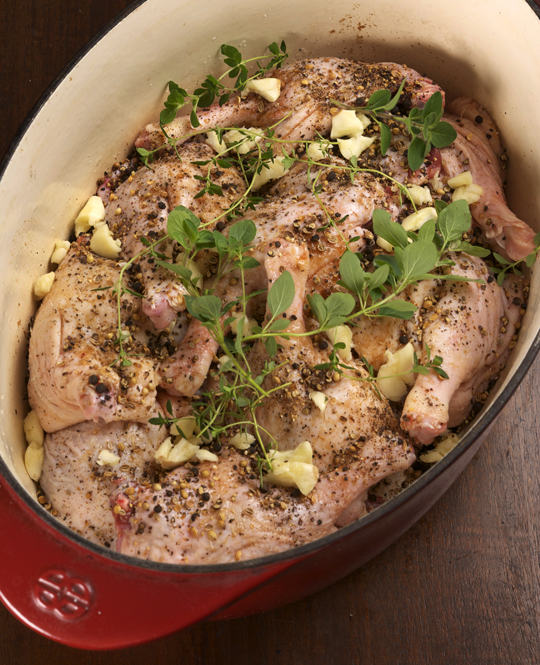 Thomas Keller prefers a simple confit, salt, pepper, maybe some thyme and garlic. I’ve decided to be aggressive with the seasonings (above): plenty of toasted and coarsely cracked black pepper and coriander, brown sugar, garlic and some oregano and thyme for depth of flavor. I’m in Detroit working with Brian today on Salumi, so these will be on the cure for several days, all the better. On a salad of arugula or spinach, see impromptu lunch above (add a poached egg for more heft). Cook with white beans (and sausage and pork belly if you wish). Got company? Pull a few legs from the fat, reheat in a hot oven, then pull the meat from the bone, separate the skin from the meat, finely chop the skin, mix it all together with some finely minced shallot and black pepper to make duck rillettes. Serve with Dijon mustard on croutons for a great canape. Duck confit is a truly generous creation. There are plenty of confit recipes in Charcuterie, and the link to the impromptu lunch includes an exact recipe, but it’s easy to wing this one with whatever seasonings you have on hand. Can you get the same results if using chicken? Would like to second this question. you can confit chicken, but it’s not really worth it, don’t get the melting tender quality. there’s a reason you don’t see chicken confit on restaurant menus. I hate to disagree with you Mike, cause I’m a real live fan, but confit chicken is making appearances on menus. I know that from sifting through piles of scalding hot chicken removing the small bones from legs. Yes, duck is superior in every way, but confit chicken is delicious. If my word isn’t enough check out the menu at Againn DC and several other places. I’ve had game hen confit that was pretty amazing, but I’ve never had duck confit, so perhaps it doesn’t compare. But you could give it a shot. Newbie question, but is it stored at room temperature or in the fridge? If room temp, what do you store it in? traditionally, duck legs were confited on farms when ducks were butchered to preserve the legs, especially in foie production, when livers were fat. great care was taken with sanitation and production because the legs were kept in cool places but above refrigeration. and of course, before refrigeration, refrigeration wasn’t an option. people have been confiting for years. But you need a fat that’s solid at cool temps and opaque, thus duck or pig fat, not olive oil (light and air issues). So: you can store at room temp if you follow good preservation protocol and make sure the meat is good and hot before you eat it. Or, store it in the fridge, which is easier. I love Duck Confit. I used to make 20 kg a week, and it sold like hotcakes on our Watermelon Salad with Duck Confit. Crazy times. I like to add juniper berries to the duck myself. I find it gives it a nice touch. Sometimes Star Anise is good too. My favorite duck to use is the Lac Brome duck here in Quebec. I find that the legs are just beautiful, as it is from the same that they harvest foie gras from. A beautiful thing, that! 1) coarse salt is warranted when it is important to extract water early on. So, for example, when making hams for aging coarse salt is best. 2) when it is not important to pull water out of the food, fine salt is AOK. When I cure bacon for smoking (without dry aging) I use fine salt because there is no advantage to drying out the meat and fat and the skin can be dried by evaporation during the formation of the pellicle after curing and prior to placement in the smoker. why would coarse salt be any better than fine salt and drawing out water. It all dissolves eventually, no? Coarse salt removes more water because it sits longer on the surface. Fine salt dissolves and penetrates quickly thereby spending less time on the surface and bringing out less water. Fine salt also reduces curing time because it penetrates faster. Of course, my observation only makes sense if the meat is “sprinkled” or rubbed with salt. If you were to bury the meat in salt, I doubt you would see much of a difference in how much water would be extracted. I think I just heard Liebling’s corpse burp. The idea of using olive oil is pretty interesting. I’ve always used duck fat. I’ve tried plain veg oil, which works but flavor is diminished. Would love some ideas on the best places to purchase the duck or the right type. Everythime i but the frozen duck at my local grocery it disappoints. try hudson valley foie or d’artagnan on line. anyone else know a good source? whole foods, probably. Try an Asian market in your area-we have a couple of good ones in Columbus, they sell both whole ducks and duck thighs. They might also be popping up a farmer’s markets; I just ordered two whole ducks for thanksgiving. I find Whole Foods in Chicago is hit-or-miss on having any duck at all, and never has “fresh” duck, always frozen. One of the things that bothered me about Top Chef — running into a Whole Foods and coming out with fresh duck. If you’re in the San Francisco Bay Area, you’re in luck; you can order direct and in large quantities from Liberty/Sonoma/Reichardt (libertyducks.com), direct from the farm. They’ll deliver anywhere, but it’s not cost effective anywhere but California. I would love, love, love a midwestern farm source for duck and goose legs. Actually, any source for goose legs, anywhere; I can only find goose whole, and while it’s easy to break down a goose, it’s… disturbing. I buy duck legs and breasts from Quattro Poultry Farms at the Rhinebeck Farmers Market. I also get unrendered duck fat. But I am going to try the olive oil. And then you keep this in fridge also? Can you provide any color on why you use Olive Oil over Duck Fat? It may just be convienence. Does the Olive Oil Coagulate the same for cold storage? To the earlier poster, I have had wonderful luck buying from hudson valley foie gras. Thanks. How low on the olive oil scale can you go? question what happens to the flavor and texture if you were to freeze the confit? Why not try it and then tell us? don’t know but don’t see why not, do try and report back! Great post – I have always wanted to try making this but never really looked into the detail. I will definitely have to put together a batch sometime soon! A perfect fall recipe–and so simple. You’re right, there are hundreds of ways to use this! Thanks again! i second the question above… can chicken be used instead? good inexpensive local duck is not very common here. i am thinking, maybe pork leg/feet would be good too… especially the foreleg part. and on #3.. the aging part… this is done in the fridge, and still submerged? won’t the fat solidify? and can this be canned? I second the canning question! can be canned but why would you? Because in my house some things have to be disguised to protect them from my dad’s cleaning frenzies. Sally Schneider proposes a “revisionist” duck confit that works surprisingly well. Instead of bathing the legs in duck fat (inconvenient for the home cook) or olive oil (brilliant Ruhlman idea! ), wrap 4-6 legs together in a carefully sealed packet of heavy-duty Aluminum foil, place in a pan in case the packages leak, and roast gently. (I generally do 300F for 3 hours, but 180 for 6+ should be good). The effect is surprisingly good. Quite a lot of fat renders out as the legs cook, and the fat bathes the meat effectively. Schneider also cures the duck more aggressively and leaves the spice on the duck during the roast. (She goes for about 1/2T salt per leg, plus lots of juniper berries, allspice, and coriander). The result is far more strongly flavored than traditional confit, but also delicious. Scaling back the cure leaves you much closer to the traditional flavor profile; in both versions, I find the texture of the duck meat is very nearly as good as the traditional methods affords. I don’t vouch for how well this keeps, and I’ve never managed to make a batch big enough that I could resist consuming it within 2 weeks. this is basically braising the duck legs, great technique for flavor but no preservation. What should I do? I made a fantastic, at least I thought it would have been fantastic confit last winter. I basically cured it with Kosher Salt, garlic, black pepper and thyme. Then preserved it in olive oil. Months go by…anticipation comes….I go to get it out of the cellar fridge (hidden in some meat doors) and….it was gone. My girlfriend decided to clean the fridge and threw them out. Should I throw her out? * Duck fat is better than olive oil for confit, because duck fat is better than olive oil; it has a different mouthfeel, spreads through your mouth differently, and imparts a different flavor (a kind of puckery-meaty-buttery thing, rather than a vegetal fresh thing). * Olive oil duck confit is just peachy though. It’s still clearly duck confit. Confit is about #1: texture and #2: the cured duck flavor. I can even see how someone would prever olive oil to duck fat. * Olive oil solidifies in the fridge just like duck fat does. * If you buy a whole duck, bone it out, and render the skin and fat, you’ll have just… enough… fat… to do the two legs on the bird, if you pack them tightly. You also get duck cracklins, which is a huge win. * I distinctly dislike over-cured duck confit. All I taste is salt. I wouldn’t leave the cure on the duck before confiting it. Especially if you’re using duck fat, which you can recycle over 3-4 batches of confit, unless you leave the cure on, in which case you’ve probably killed it after the first batch. * Mark Bittman says, in the NY Times, that chicken confit is delicious. Take that for what it’s worth, and note that he doesn’t even bother to cure his chicken. Chicken produces nothing resembling the amount of fat that duck does, which is presumably why chicken confit isn’t the classic dish duck confit is. But chicken fat is delicious in its own right. Anyone got a source for chicken fat in bulk? buying a whole duck I find I get enough rendered fat to confit–grt option. This probably sounds dumb, but it never occurred to me that I could use something other than rendered or purchased duck fat to make duck confit. Consequently, I’ve probably only made it once. I’m so happy to know that I can use olive oil and still have a great tasting product. I will definitely be making this much more often in the future. If you have a sous vide/low-temp rig, you pretty much have a duck confit dispensing machine at your disposal. You can do the whole thing in a single zip-loc bag, on two consecutive mornings — while getting the kids ready for school! — morning #1, season some duck legs, stick ’em in a bag with herbs, stick that in the fridge; morning #2, rinse the duck legs, put ’em back in the bag with some fat, and dunk them in a 180f water bath. Done. The biggest win with sous vide confit is that it takes a fraction of the amount of fat to cover the duck. One of those little bitty overpriced D’Artagnon tubs will do a couple bags easy. I, for one, really appreciated this blog and the comments which followed. Thank you all. Second that. The level of commenting on this blog is extraordinary. Thanks all. I third that. I’m continually impressed with quality of comments, both questions and answers. To help clarify – Confit is a technique that technically means to preserve so that means you can do this to many foods: duck, chicken, pork, garlic, onions, lemons, tomatoes, etc. If the meat is cured properly and covered completely with fat or oil, it should last up to 4-6 months in a cool dark place. Since you have preserved food by this process there is no reason to freeze it. My question about freezing is purely a space issue. Fridge space is limited while the chest freezer is bigger. bill is correct. but has to be done properly. About once a month I buy a couple of Pekin ducks from Whole Foods. I break them down, render the fat from the carcass in the oven and make duck stock from the browned carcass. Salt the legs for later confit sous vide in a bag with some of the duck fat — it doesn’t take a lot of fat that way. Then I’ll pan-roast one of the breasts ( or more if I have company for dinner) that night à la Ad Hock at Home. Oh! Oooh! Aaah! Welcome autumn! I take issue with your assertion that duck confit is always on hand until April. No, sir. It is devoured in a week. Thank you so much for this. As a home cook who is fascinated with food and learning, duck confit has always been on my list of things I would like to learn how to prepare but seemed unapproachable. Your straight forward instruction takes much of the fear out of it for me and I am thinking this would be a wonderful weekend project to embark on. I’ve made confit with chicken legs. I have done it twice – one time with olive oil, and one time with reused duck fat from a previous confit. Chicken has the distinct advantage of being way cheap. That said, it pays off to get good-quality chicken. The end result isn’t close to duck confit, but it is pretty good in its own right. The texture can get a little ropey, so control the heat carefully – duck can take what chicken cannot. I used a fivespice cure on mine and I liked it a lot. You don’t have the total unctuousness of duck, but the chicken is a fine substitute if you are unable to get economical duck legs or you want to change things up a bit. I also suggest removing the skin; it’s nothing spectacular, because it isn’t the thick, fat-shot skin of duck. Another factor is that because it’s cheap to make, you don’t have to be miserly about dispensing the chicken. If you at all have access to duck fat, though, add it in even if you cut it with olive oil (I used inexpensive, neutral-flavored oil; extra-virgin would be a waste). Duck fat is highly saturated and makes the legs that much tastier. After curing, rinsing and patting dry, heat the fat in the crockpot and then turn down to low. The temperature mimics a slow oven nicely but doesn’t heat up the house Submerge meat and cook until very tender. Freezing works well when I coat the meat in fat. Or store meat in a jar or crock with the fat poured over it in the fridge. Canning Duck rillettes is one of my goals but probably needs more research since pressure canning meat in fat is a bit tricky. I just need it to be a little bit cooler, then I’m going to try this – I have never made confit – and see how long it lasts. Not how long it keeps. I’ve used chicken legs or simply thighs for confit. Mainly, as many people have stated, because of cost issues. It does improve the flavor of the chicken greatly, but it does not compare even remotely to the greatness of duck confit. Heck, of all the confits I’ve done, duck is King. I’m with ruhlman – tried chic confit, didn’t care for it.. I had chicken rillettes at Bouchon and they were a revelation. Nothing has ever tasted that much like chicken. If I had a good consistent source for good chicken fat, I’d make them in a heartbeat. If you’re ever in Chicago, check out the confit chicken thighs at Kith and Kin. Very good chance of changing your mind on the “worth it” scale. we confit pork here in Romania, duck not so much, we’re a poor country. we even confit sausage – yes, fresh pork sausage, fried in pork fat then preserved in a huge clay pot together with meat – shoulder, belly, whatever. This fall I’m planning a huge jar of composite confit – duck, turkey, chicken, pork, sausage, maybe some game too, if my hunter friend is lucky and generous enough to share, probably cooked together in a big crockpot. A timely topic.I have been craving Cassoulet for months and I know as the temperatures drop over the next few months, the urge will intensify. I have emailed a few local restaurants suggesting they put it on their fall menus –nothing yet. It looks like I will have to make my own which is a daunting task. This confit sounds supremely do-able. I love the comments on this site. lots of great information floating around for a home cook like myself who is obsessed with food preparation. Just last week, I confited chicken wings using lard. I wanted to try something different with wings and happened to have some lard in the fridge. Cured them overnight with salt, pepper and garlic. Threw them in the oven with the lard at 200 for 4 hours. Let them mature in the fridge for a couple days, then crisped them under the broiler. They turned out great. How long will duck confit last if totally immersed under duck fat, and refrigerated? Basiclly, airtight. indefinitely (or until too many other fridge odors invade or light makes rancid. I have confited pig ears from last april I intend to serve this weekend. I second your assessment of the life span of confit. As I mentioned above last Christmas I served goose confit that I made in 1995.
mr ruhlman! this is a very inspiring post! i am very much encouraged to make confit… if i cannot find good duck.. i’m doing pork legs.. the lower, bony, gelatinous part! thanks for the crockpot suggestion! never thought to use our slowcooker for confit… now i don’t have to think of having to stay up watching over the oven. I hope that this post encourages many home cooks to experience the confit process. It was one of the earliest classic techniques I learned in my career… from an Alsatian chef. I’ve repeated the steps with religious fervor throughout the years tweaking this step or another until I felt I could do it instinctively and know the exact outcome. A word on the chicken confit. We started to play with this over a year ago, and the result is… very incredible chicken. Of course it cannot be compared to duck confit (the same as comparing roast chicken to roast duck… they are different all around). Simply put, eating chicken confit is better than almost any other way to prepare it. If you need to acquire chicken fat, look for butts or backs and render it out or use schmaltz if it is available to you. We have ‘cheated’ and mixed our chicken fat with duck fat and bacon fat. Multiple fats are the way to go for great flavor complexity (especially the welcome smokey flavor of bacon fat). Chicken confit roasted crispy in an oven or rolled on a smokey grill is a great dish. I use duck fat to confit duck. I have never tried olive oil but, I do use it for tomato confit. Gascony here sounding in, Michael. Sorry, but I always have to take the traditionalists role when it comes to confit. If not, we’ll lose the why behind what we are doing. Confit means preserve- as Bill T. explains and Dan in Romania demonstrate. Here we, too, still live such seasonal lives that making confit is exclusively late fall and winter because that is when the ducks are fat enough, the weather is cold enough and season demands richer food. -Each whole fatted duck should supply enough fat for confit- working in groups of 6-10 ducks makes a big stock pot of golden fat. Roasting ducklings are not raised to be fat enough. Fatted ducks usually weigh in at 5-6 kilos each. -Too much salt and too much curing time is the usual problem- a scant tablespoon of coarse sea salt per leg and 12 hours is enough. -In the old days, the lovely confit pots did rest in the cool wine cellars for 4-8 months. Now we sterilize the confit in jars or cans for keeping in the pantry for a year-season to season. Confit, like foie gras and the duck fat itself, does freeze very well. – we confit all the parts of the duck, not just legs- breasts, wings, necks, hearts and gizzards. – Cooking long and slow on the stove is the traditional farmhouse way. – Confit needs to age or ripen like wine; under a couple months it risks being stringy and tough. – And yes, chicken does confit to great success, but it is usually reserved for an old laying hen so the meat is both sturdier and more flavorful. I really appreciate this post and the thoughtful, informative comments people are contributing! 3. Chill and reheat: Allow them to cool submerged in the fat for at least 24 hours, but [the longer the legs are in the fat, the better (three to four months being optimal)]. Thanks again for helping take the mystery out of duck confit, one of my favorite quick dinner ingredients. Wait, is this guy for real? I’ll give you that, if you were to start reading the recipe at step 2, you might be confuse – but why would anyone unfamiliar with the recipe do that? And the comment about resting time…sheesh. Stop splitting hairs. This a blog, not a textbook. This can’t be a real comment. Gotta be a joke right? Been way too long since I made duck confit. Seeing this makes me excited though, time to render off some more duck fat! What kind of crock do you keep yours in? I would have a hard time parting with anything I use regularly for the whole winter, but this doesn’t seem like a Mason jar task. I checked the internet for confit pots, and found only ~$400 antiques, and none seemed to have lids- if I were to have a potter friend reproduce one, should I have him make a lid? Anything else I should know about the storage vessel? Good question. I had the same thought. I assume plastic containers would leach polymer. Glass, Pyrex?? A lid isn’t really necessary with the fat cap, at least in traditional farmhouse preservation. The fat layer, so long as it completely covers the duck meat, should protect against spoilage. when cool, i transfer to plastic container. if using olive oil, cover to keep odors out, if using pork or duck fat, true, less important. I think asking my potter friend was the best idea I’ve had in a month. I, too, wonder what container you would suggest for storage? I know I would not want to part with any of my enamel cookware for months on end. Presumably once the duck has returned to room temperature, I can transfer the confit to any suitable container? Also, if I wanted to try this recipe using duck fat, do you know of any reliable sources in Cleveland? More experienced and wider read authorities (bob del Grosso seems a likely candidate, as does Ruhlman) may have more knowledge on this, but it seems to me that you would not want to remove the cooled confit from the cooking container, since this would almost definitely contaminate it after the cooking process effectively sterilized it. this is a good point, wouldn’t do this if I wanted to preserve at room temp. This post, along with all the comments and responses, has been the most comprehensive treatise on duck confit that I could ever have wished for. Thank you! And thanks to Kate for her input from Gascony. So then could one use coconut oil instead of the olive oil/duck fat/lard? The usual stuff (usually used to pop popcorn, but I use it for soapmaking so I have large, inexpensive quantities of the stuff) melts at 78 degrees F, so kept in a cool place it would stay solid at room temperature. And I’d compare the flavor of the coconut oil to a cheap oo – very mild and slightly buttery. Never tried using olive oil., always used duck fat too. Like this recipe, its straight forward. Great answers & questions here, thanks for sharing. This just revives my interest in getting up a sousvide rig. I really like the thingamagic that is a sousvide dedicated water thing with the really cool temperature control electronics. Anything that uses large amounts of fats or oils …. just feels wastefull to me wether frying or confiting… But I am an eager student and a very interested home cook. Great job guys.. I learned a lot here. Does this work with wild duck? I seem to have an over-abundance of those this time of year and would like to try something different. Using olive oil, it might be ok. You would need a billion wild ducks to get enough duck fat. And it would be gamey too, I would think. it would work. if it would be good is another story. i don’t work with wild duck. they’re tricky. I’ll try it and let you know. I confit maybe 15-20 wild ducks or geese a year, and it works beautifully. At the risk of too much self-promotion, I have on my site tutorials on rendering wild duck fat, confiting pretty much every game bird there is, and using wild duck confit. Suffice to say that it works. If you are in a place where your ducks are really skinny, supplement the wild fat with domestic — and I *always* confit using sous vide, which uses far less fat than the traditional way. You don’t even need a sous vide machine. A stock pot on low heat works just fine. Takes a little patience, but it works. I bet a sous vide version cooked for an equal amount of time would be dynamite. Flavors are enhanced, so would need a miniscule amount of fat. thank you for this post! i have never tried to make this at home because i could never get my hands on a tub of duck fat. i’m exhilarated to find there’s an altenative, the thought never crossed my mind. i have quite a bunch of pork fat from a pork belly confit i made last week, i will try it with that. i’m already seeing it on the plate with a cube of pork belly, or maybe a seared scallop. so exciting, thanks again! @Hema, we have gotten duck fat from a local chef if we called and asked if he could procure us some, but we were friendly with him and he has since moved on, so I too would like a source – I wonder if other chefs would be open to doing this? FYI Kaufmann’s poultry at WSM does not sell it, though they do sell duck legs. You can literally order duck fat from Amazon via one-click shopping. It’s even pork free! Wait, what? This post inspired me to look more into the process and I found that some seem to salt for a longer period (2 days as opposed to 12 hours) and then cook at a higher temp for a much shorter time. I’m curious if that works as well. (for those time challenged souls) This almost makes me want to raise ducks again…almost. cooking at too high temp can make them stringy. Technically, anything with garlic in it isn’t even refrigerator-stable, right? For the same reason that you can’t keep garlic oil for more than a few days. Does pink salt do anything to counteract this? garlic can have the spores that grow into botulism bacteria, and yes pink salt would counteract this, as would cooking it for 12 hours and leaving it submerged. I may be a wierdo, but despite the fact that I make some duck confit annually (and love the fat for potatoes) I don’t like it in Cassoulet. I think it gets lost. YMMV. I too dislike overly cured confit. The commercial duck leg confit available at meat markets in the Bay Area is invariably too salty. What if one used no salt at all in the cure? Would it still be confit? Would it still be refrigerator-stable? Would it have the right texture and flavor profile? laurant manrique, from gascony, packs his legs in salt. i think that would be too salty. but if you’re cooking it in a stew of beans, the salt would season the whole stew. the salt would also ensure indefinite preservation. Duck Confit is one of my favorite dishes. The coconut oil thought is brilliant. Don’t get me wrong…I love the classical way, but introducing the flavors of coconut can open up some very cool avenues!! For sure! Many “chefs” these days put so many over-powering aromatics into their confit preparations (cinnamon sticks, star anise, clove, thai chili). I think the coconut oil would give this direction some credence; perhaps even push the confit toward a Franco-Vietnamese feel. I get my whole duck cut up at Uwajimaya in Seatte, made a broth with the leftover, duck breast and confit the legs. Thanks to Kate, I will try and do more confit, I saved the fat from last falls duck and froze it. Liver, neck and all are heading to the fat this year. Would a lean venison go well with duck fat? Have Brian cough up some venison and try it seared with a coating of ancho blackberry sauce. A little over 60 days till eggnogg season! I’m a huge fan of duck confit, but have never made it myself at home. That will definitely change now. Thanks for posting! Michael I have been testing a new gadget I got at Price Club last week. It’s a fancy rice maker/steamer/slowcooker thingamabob…. The brand is “Aroma”. I have no doubt I can confit anything using this gizmo. It’s easier to handle than a slow cooker and it is way smarter. The keep warm on this thing is a real keep warm….as opposed to any crockpot I have ever used. Keep warm is about 160 deg… For slow cooking all I need to do is specify a time duration. The thing is smart enough to presoak the rice whatever that is… My take on it is that it is smarter than a crockpot and runs a the right temperatures. Still playing with it but so far I like wha I see. This is great Michael-thanks for the info. I always thought that I had to use duck fat to make confit and I have always balked at paying the price. Now I can make some with olive oil – always have lots on hand. “lectric lady” may want to check out Hank Shaw over at http://honest-food.net/. He has recipes for pheasant grouse, partridge or quail confit. Just thought of another question: can meats be confitted using butter or clarified butter? Very helpful post and comments! If you have a batch of duck legs sitting in solidified duck fat/olive oil in the refrigerator and want to just take out one leg, how do you do that? Do you have to heat up the entire batch to first liquefy the fat , or is it easier than I’m envisioning to get one leg out while everything’s solid? This is my first time making confit. I have a farm where I raised and slaughtered Pekin ducks this summer. My mouth has been drooling thinking about making this dish. The breasts are going to be made into prosciutto; the rest of the carcass I am making into a recipe for duck stewed in wine. So if you buy a whole duck just to make confit, it definitely can be utilized to it’s fullest. The recipe for wine stewed duck requires the fat to be trimmed off which will work well for the confit. Thanks for the added variation in spices from the ones in Charcuterie. Cheers!